Comprising one-fifth of the world's fresh surface water, the Great Lakes make up the largest group of freshwater lakes on Earth and form one of North America's most important waterways. Great Lakes cruises might begin in cosmopolitan cities like Chicago or Toronto and explore dynamic American and Canadian ports that shaped the region. 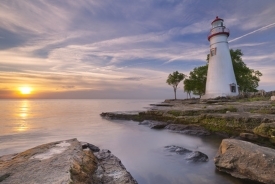 You can learn about nautical history in Sturgeon Bay, the largest shipbuilding port on the Great Lakes, or discover cultural treasures like Victorian Mackinac Island, where most motorized vehicles are forbidden and transportation is mainly by bike or horse-drawn carriage, and Sault Ste. Marie, a scenically diverse port with a history influenced by French fur traders and Native Americans. Other excursions include a Miller Brewery visit in Milwaukee, a tour of Cleveland's Rock & Roll Hall of Fame and recreational water sports such as kayaking, scuba diving and fishing. The Great Lakes cruise season runs from May through October. Great Lakes cruises typically range from 7 to 15 nights in length. For a list of Great Lakes cruise ports, click here.